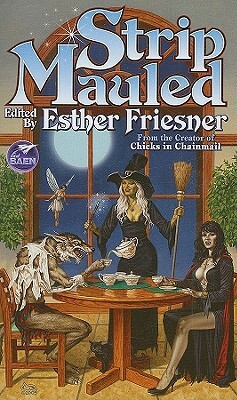 The Follow-Up to Witch Way to the Mall from the Creator of the Chicks in Chainmail Series. It’s the Werewolves’ Turn to Howl Across the Well-Kept Lawns and Neat Picket Fences of Supernatural Suburbia. Werewolves and the suburbs are a natural go-together. Okay, so they’re not the Obligatory/Iconic Suburban Golden Retriever or Chocolate Labrador, but they’ve got a much better chance of taking home the Best in Show ribbon than their Undead rivals, the vampires. In some suburban households, if it brings home a trophy, who cares if it also brings home bloody chunks of the neighbors every time the full moon shines? And let’s not forget one more advantage to the suburban werewolf: If his lupine side does something nasty on your lawn, his human side can come by later with the Pooper Scooper. In your face, Dracula! Therefore, welcome to the fur-sprouting, mall-browsing, moon-howling, latté-sipping world of Strip Mauled. You’ll like what you find. Stories of suburban lycanthropy by Sarah A. Hoyt, Dave Freer, K. D. Wentworth, and more—including Esther Friesner herself.